Today was pretty cool, we caught a nice mako shark on a shark fishing charter. 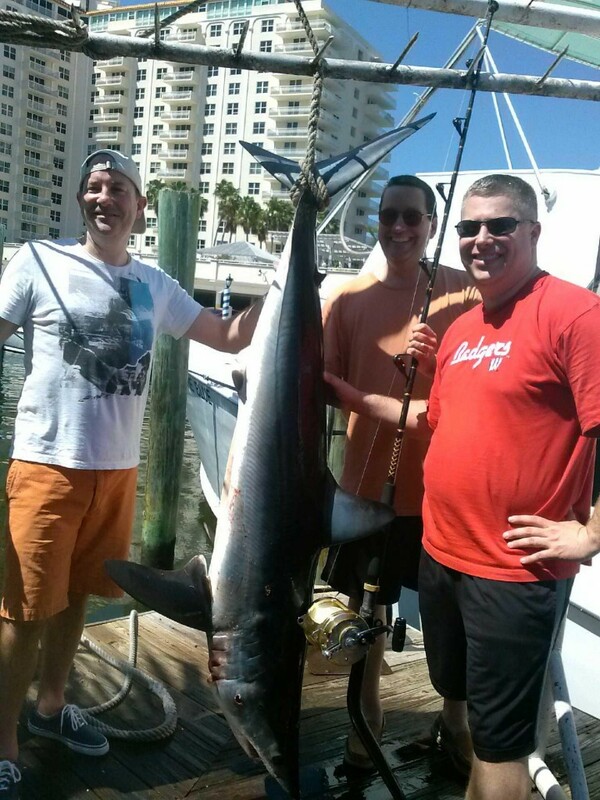 Mako sharks are rare to catch fishing in Fort Lauderdale, so it was a treat for us. 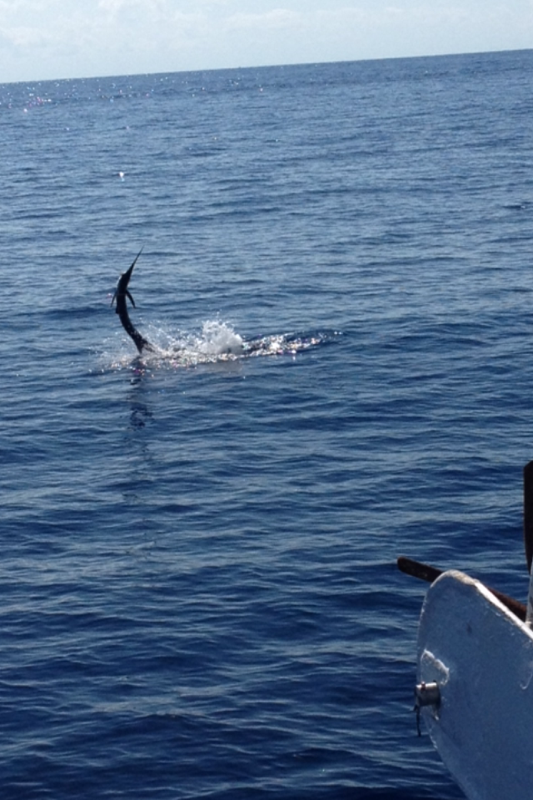 We caught the mako in 350ft of water, kite fishing on the edge of the Gulfstream. We were shark fishing with a spread of live goggle eyes in the kite and some big shark baits positioned mid-depth and on the bottom. The mako took the mid-depth bait, a big bonito butterflied and rigged on heavy piano wire (#19 wire). We knew it was a mako right away because as soon as it took the bait, the mako shot straight up to the surface and skyrocketed, jumping almost 15ft out of the water. Makos are one of the very few sharks that will jump out of the water when on the line and they are famous for jumping up to 30ft high. They are an awesome shark, with the gnarliest set of snaggle-teeth you will ever see in a shark. They are shaped like a torpedo, perfectly hydrodynamic to achieve tremendous speeds. We caught the mako pretty quickly, in under a 40 minute fight on our 80W Penn International. 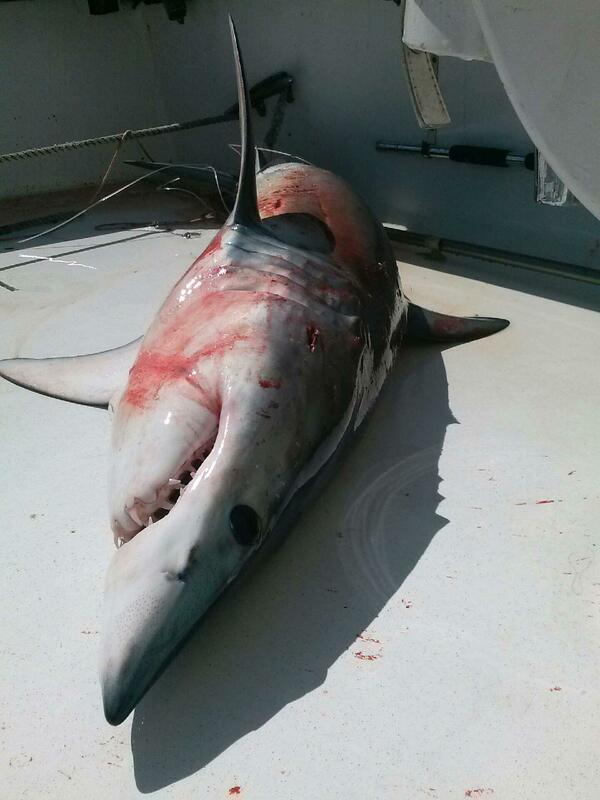 This is shark fishing season in Fort Lauderdale and the sharks are snapping, but mako sharks are quite rare for us to catch this far south. It was very cool to see. 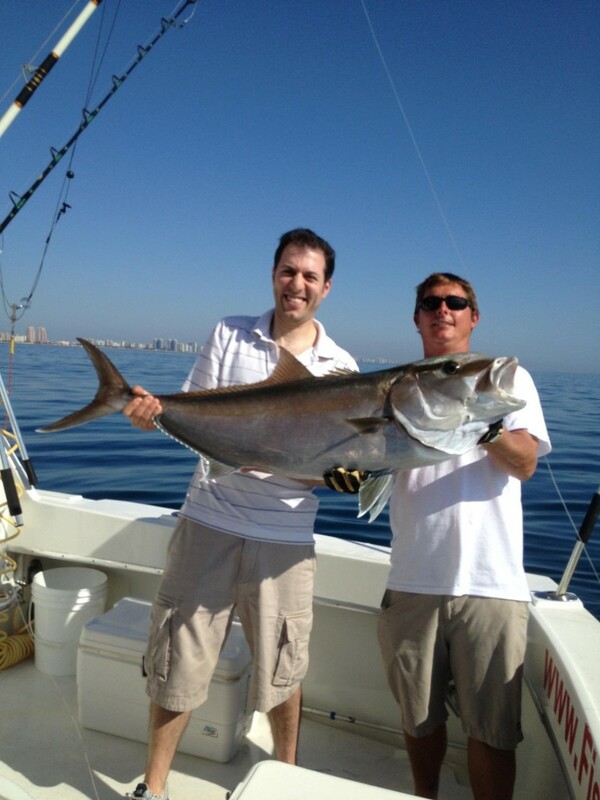 We also caught a nice amberjack deep dropping on a wreck. Nice fish! 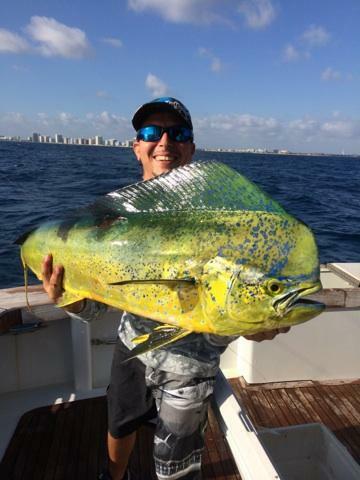 The mahi-mahi bite is hot just outside the reef of Fort Lauderdale. 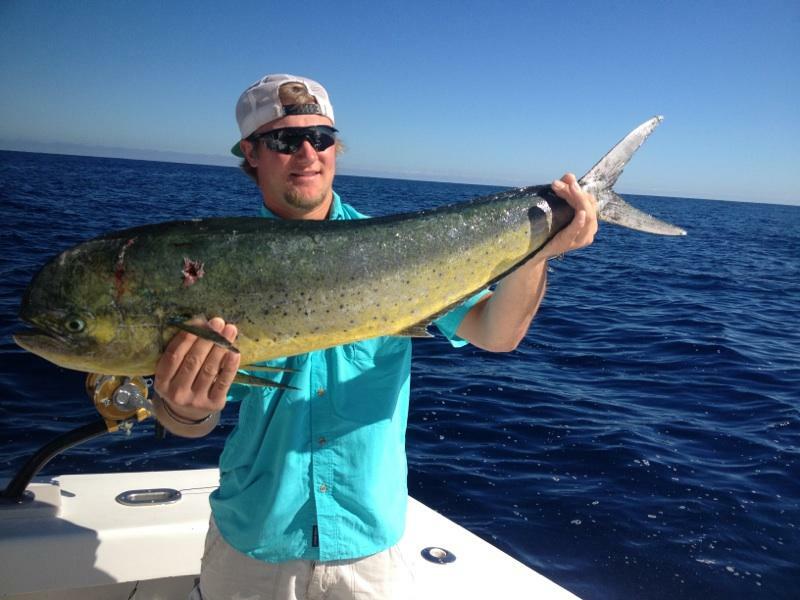 For a few weeks in March, the mahi-mahi come in closer to shore than normal to do their annual spawn. It usually happens the last couple weeks of March. This week, we’re getting into some very nice mahi-mahi in 100-300ft of water, just a mile off our coast. Trolling and kite fishing work best for catching these dolphin fish, trolling for action and kite fishing for the biggest ones. 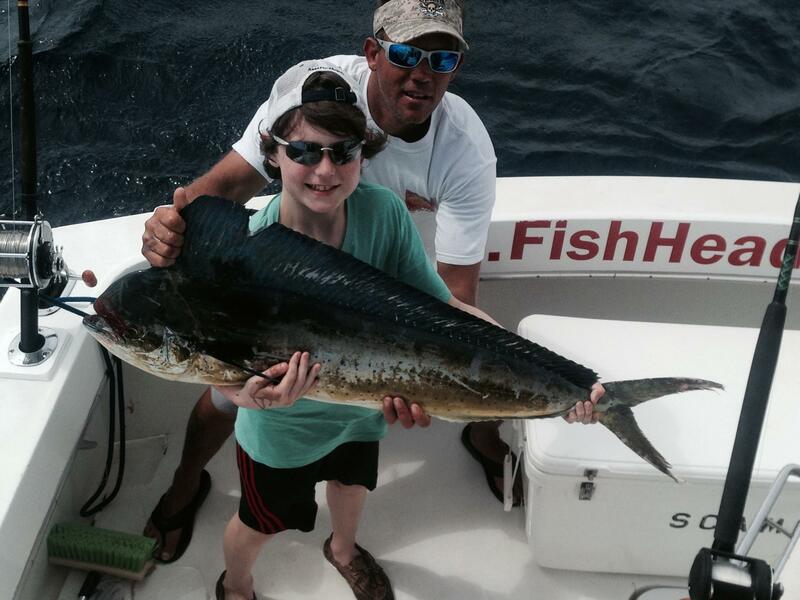 Throughout the year, most of our dolphin are schoolie sized, 3-5 pounders. This time of year is when the big ones hit, 10-20 pounders are much more common and a few monster bulls will be caught also. Tunas, wahoo and sailfish are also biting good and in the same area where we’re catching the dolphin. 100-300ft of water is the magic zone to catch just about anything this month. Blackfin tunas are schooling up and being caught on bug jigs and spoons. Bonitos are mixed in with the schools of blackfins. Wahoo usually stay deep, sometimes underneath schools of blackfins that are busting on the surface and sometimes just randomly on their own. Sailfish are still moving through our waters strong and are being caught with some regularity while kite fishing. You can’t go wrong no matter how you fish in March. Amberjacks, groupers, snappers and more are showing up around the wrecks. Good action on the wrecks in 200-400ft of water. 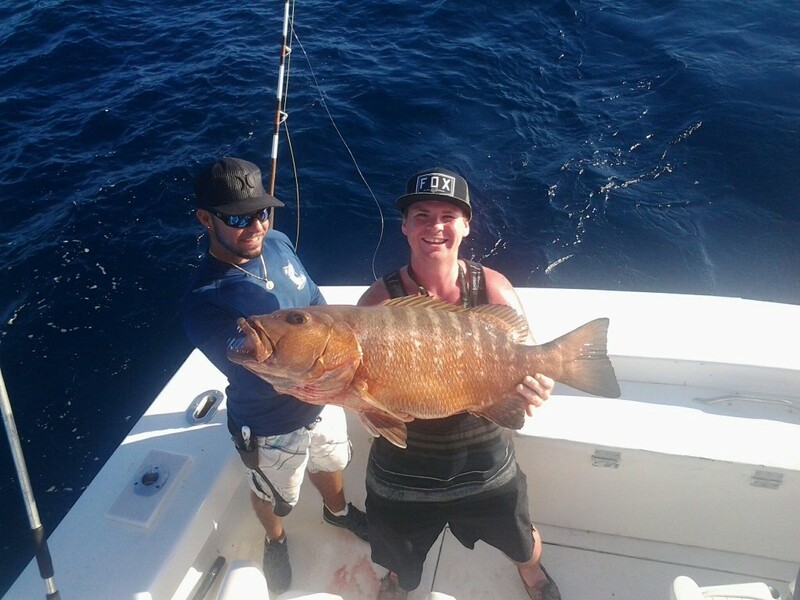 A couple days ago we caught a nice Cubera Snapper. We hardly ever catch those. Just goes to show you how much variety and unusual fish are biting out there. Amberjacks have been monsters, some of them over 50 pounds. They are stacking up around the shipwrecks in awesome numbers and biting anything we throw down to them. 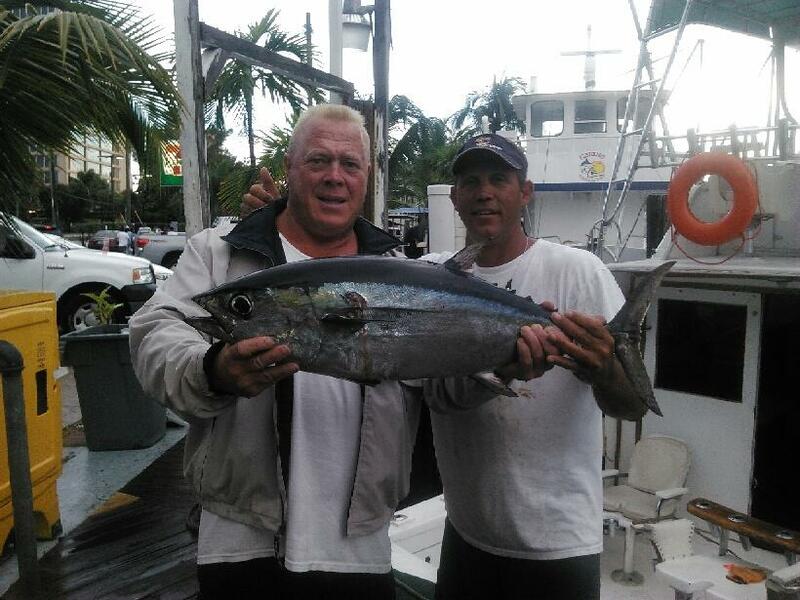 Andy, one of our regular sportfishing customers, went fishing the other day and said he wanted to go jack fishing. We did and we caught some monsters for him. 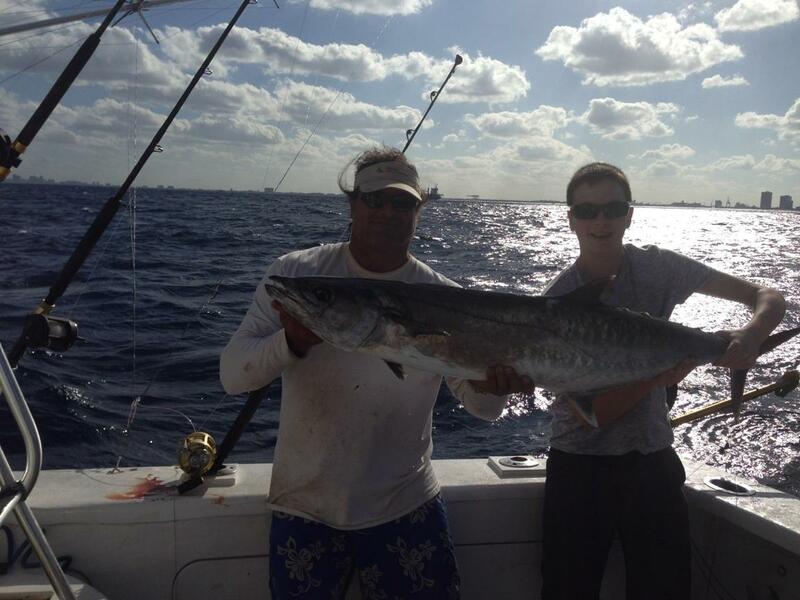 The fishing is going great this March and it should last throughout April and May as well. Good luck to everyone fishing this week. It happens every year. Whenever we get a strong easterly wind in March, the dolphin fishing action heats up in Fort Lauderdale. Dolphin come right in on the reef to do their annual spawn. These dolphin, normally an offshore fish, are being caught inshore of 300ft of water, just outside the reef. While there are some schoolies mixed in, many of the dolphin we’re catching right now are nice size ones, 10-20 pounders. This is the all-around best time of year for dolphin fishing. It usually lasts anywhere from a couple weeks to a month and a half, depending on how long we get the strong winds out of the east. Dolphin fishing is awesome but they aren’t the only fish in the sea. 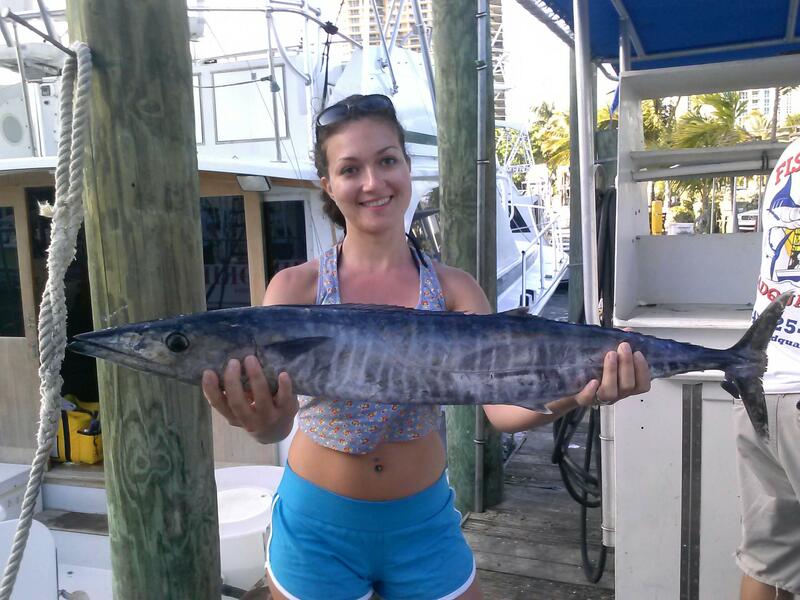 This is also a great time for sailfish fishing, pretty much the same waters where we’re catching the dolphin. Sailfish feed on the same baitfish and swim in the same water column as dolphin do, so we catch both species doing the same fishing techniques. Kite fishing and trolling are the best fishing techniques to target these surface feeding gamefish. This week, the sailfishing has been going off, especially in the afternoons. 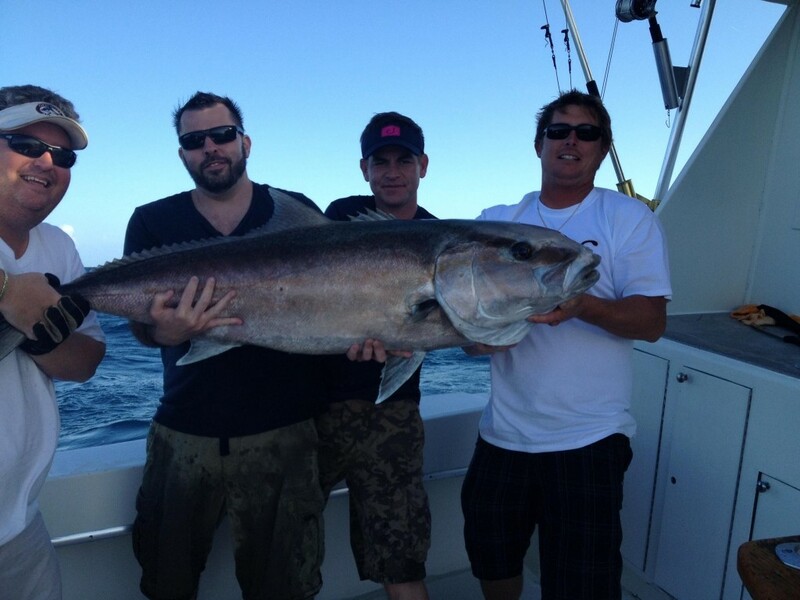 Wahoo, tuna and kingfish are also biting pretty good on the reef. This time of year, just about everything is biting. Trolling is especially good this season because the boat is moving and you can cover a lot of territory. Wreck fishing is also great this time of year because of the amberjacks. Big amberjacks stack up around the shipwrecks in 200-300ft of water. The wrecks are a great source of food with the numerous schools of baitfish that also make these shipwrecks their home. Amberjacks are tremendous fighters. They are extremely fun to catch as they put up one helluva fight. Groupers are around the wrecks too, but unfortunately, if you catch one, you have to throw it back. Groupers are out of season until May 1. Fortunately with all the dolphin action, sailfish around and amberjacks around the wrecks, there’s plenty of fish to keep an angler busy. Good luck to everyone fishing this week.